Daryl from Fabric Spark invited me to pick a blogger's bundle and she has one just like that photo above for me to give away to one of you. It took me a long time to decide on the bundle I wanted to work with because Fabric Spark has such a beautiful collection of fabrics available. I have to say that I am totally in love with the she can quilt bundle, which you can find in the shop here. Fabric Spark is an online fabric shop which the lovely Daryl started this year. She is based in Toronto with this primarily online shop although she is venturing out to events like CreativFestival as well. 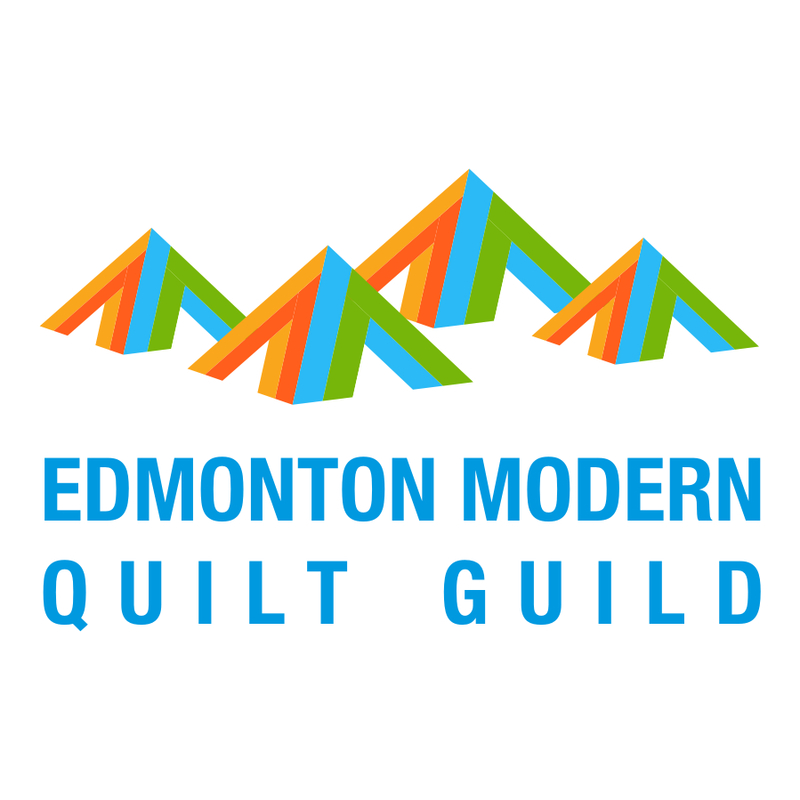 Fabric Spark carries a carefully curated selection of modern quilting cottons which work beautifully together. You will not see all the fabrics in a single designer's fabric line, but instead Daryl has a beautifully balanced selection of some of the best fabrics from several designers. I had the pleasure of meeting Daryl last week when I was in Toronto and was able to pick up my bundle at the same time. I might have also ordered some additional fabrics and packed an extra large suitcase too. 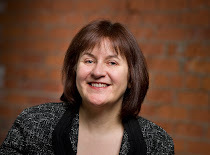 Daryl is lovely, excited about fabric, sewing and quilting, and just so easy to get to know. I am looking forward to the next time we are in the same city for another visit. 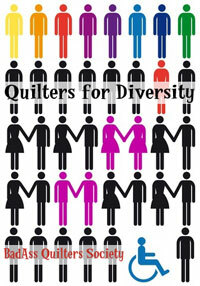 I will be cutting these fabrics up soon - I have two quilts planned using them, stay tuned. In the meantime, here is how you can enter to win the giveaway. I will randomly draw from the comments on this post after 6 pm Friday night - Halloween - and announce the winner then or on Saturday morning. 1. Leave me a comment. Please take a look at Fabric Spark - click here - and let me know in your comment what fabric you especially love there. If you want, you can join the Fabric Spark mailing list, just scroll to the bottom of the opening page. 2. If you are a follower of mine, feel free to leave a second comment letting me know where you do that and how. Please, please make sure that your comment is connected to your email or leave your email for me in the comment. Just being part of Google + does not mean I get access to your email. I am willing to search a bit to find the winner, but you need to have some kind of breadcrumbs to allow me to do that. If I cannot find you, I will immediately draw again. Good luck and thank you to Fabric Spark for such fantastic give away! As usual, I will not reply to comments on the draw but I do read and enjoy them all. Love Fabric Spark and love gramercy!! I absolutely love the Cleta - Cycle of Life - Luna fabric. Of course I love anything with bikes on it! I also follow you on Feedly. My first comment doesn't seem to have appeared, so posting again. My favorite fabric is the Nani Iro Freedom Garden, France. It is simply gorgeous and I think the store has a very thoughtful selection. I'm glad to know of it. I love the new print from Suzuko Koseki (Fashion Magazine). I like the "Bangles" print by Valori Wells. And a nicely chosen bundle you put together. I follow your blog through my feedly reader. Thanks! I love the nautical rope print! I love Stillwater Elementary Equations...ny husband is a civil engineer and I made him one wall quilt for the office using Architextures...I may have to make another using this! Thanks for the chance to win! I think my favourite at the moment is Lovely. But it was a difficult decision. There are so many pretty.bundles. 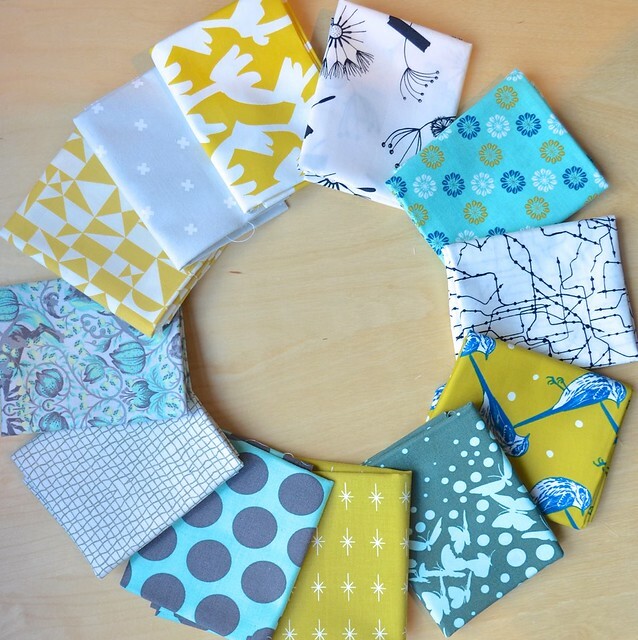 I love the Cycle of Life fabric! I'm already a follower with bloglovin. That Ghastlies print with the butterflies and moths has always caught my eye. I like the mix of prints and colors in your bundle, especially the mustard. What a beautiful shop! I can't go past Melody Miller's Cotton & Steel Arrows in coral metallic. I really love the Ipanema Main Blue fabric. Love the Feathered Coral Night in Angela Walters Drift Collection. And that's a beautiful bundle you picked out. I like the Serpentine Shade fabric by Tula Pink. It is hard to choose one! I follow you via Bloglovin. 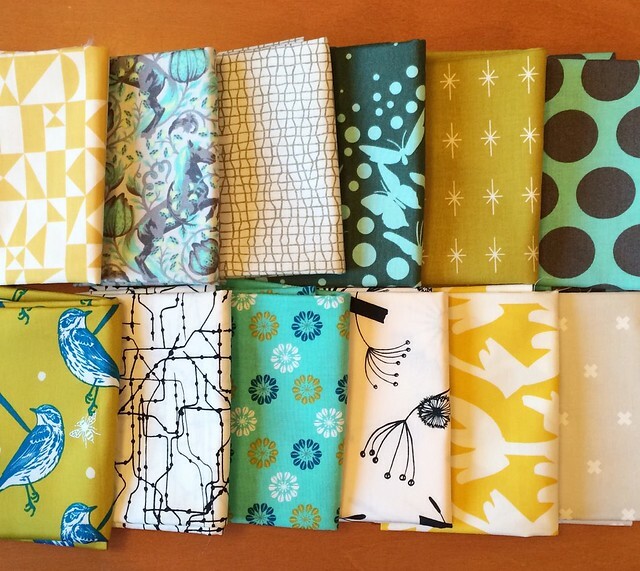 Lovely bundle of fabrics you chose. Cleta. I love bikes as much as I love fabric! My blog is even called Pedal Sew Lightly. I like Janet Clare's Field Guide! I like the Yuwa fabric. I've never seen that before. Thanks for the chance to win! I follow on BlogLovin'. Thanks for the chance to win. there are so many cute ones but I think I like the ninjas best! Congratulations on such great selections for your bundle, really lovely and make me want to use them straight away. I would try the Umbrella print remnant pack but I was spoiled for choice. I do love the Gramercy line. It really needs to be in my stash. Love the colors in the FQ bundle giveaway also. They work well together. This is a great bundle. I was born and raised just outside of Toronto so loving fabric spark. Anything anna maria horner is the best! I love the Cotton + Steel line. Thanks for the giveaway! Pretty bundle! I am wanting some of the Cleta collection. I am making a quilt with a bike theme and those fabrics would be a perfect addition. Thanks! I can never pick which material I like the best. It's all great. I love the Antler Damask Black. Thanks! Fabric spark is one of my favourite stores, and I also saw Daryl at the Creativ festival. I bought some yardage of the cotton and steel x fabric in the creamy colour so I would say that is my favourite at the moment. It's hard to choose since there are so many great ones. I do get her emails too! I follow you in The Old Reader. I love all of the Art Gallery Fabrics they have in stock! I love the delicate design of Floral Frolic in Coco! Very pretty! And I think you know I am a long time follower! I really like the honey house fabric. Thanks for the chance to win some fun fabric. I love Modern Neutrals - Pathways in Steel on Fabric Spark...it's perfect for the manly quilt I want to make my son! Michael miller Norwegian wood foxtrot is adorable. Thanks for the sweet giveaway. Freedom Garden looks so interesting. Hard decision-either Lovely or At the Club. Great website! I like CLETA - CYCLE OF LIFE - LUNA. My husband is a cyclist! Wonderful selection - I see (on sale) Circle Grid Blue and it is yummy!!!!! Great bundle - you have a great eye for colour and pattern. HI, I really like Michael Miller's Norwegian Wood Foxtrot ! Thank you for a great giveaway! I'm just stopping by to say HI! and to say how exciting and cool it is that you have your own bundle!!! Neato!! Your bundle is gorgeous! I also like the Tula Pink Foxfield bundle . I love the Cleta Riding Diary Burst--thanks! I love the Gramercy line! I love the bloom mosaic in deep water (blue!) and think it would make great fussy cut/kaleidoscope hexies! P.S. I love your bundle, I think I forgot to mention that in my other comment! 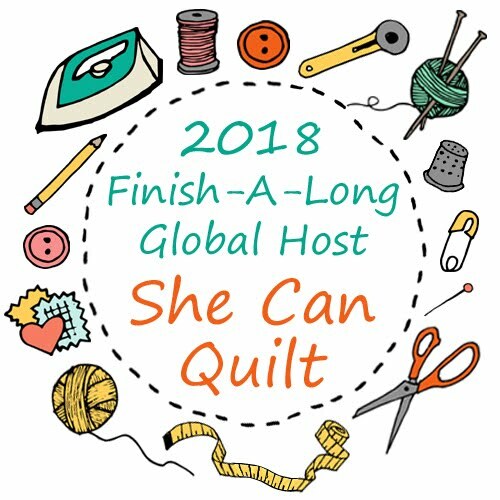 Love the "She Can Quilt" bundle! Of the individual fabric, Brassica In Gray is my favorite. I love the foggy pastel colors of the flowers in that piece. My favorite is the Ric Rak Rabbits - Love Bunnies. Oooh - I love Circle Grid in both blue and reds - and the blue is on sale! I am loving your choice the She Can Quilt bundle. Beautiful fabric choice, can't wait to see the end results. I like the Momo Advent Garden theme. My granddaughter really likes owls these days - so I love the owl fabric she has at the shop! I really love Cleta-Cycle of Life fabric! I signed up for their newsletter - great shop! Empire fishnet -not seen it before and it's beautiful! Besides your lovely bundle I wouldn't mind having some Umbrella prints remnants. I liked it all! 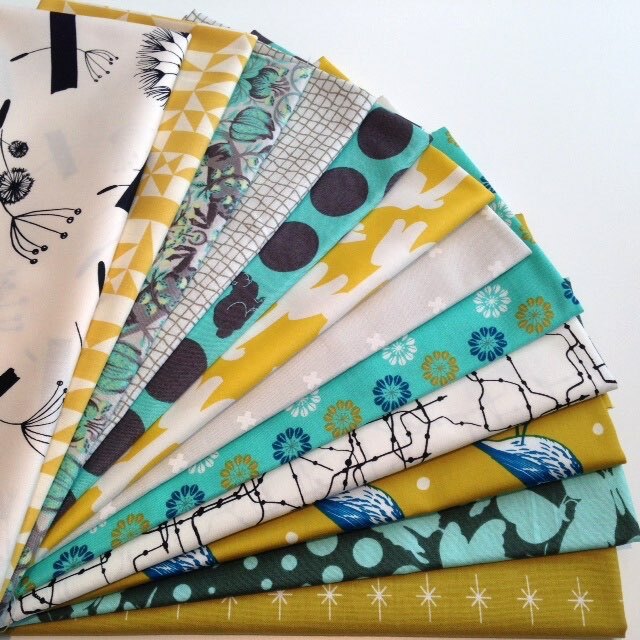 I really have my eye on the Honey House Sunflower; I love the mustard yellow, like in your bundle! I also like the selection of Free Spirit Solids, which are so smooth! It's hard to pick a favorite, but I am loving the cotton & steel basics right now. Cotton & Steel Basics fabrics are a favorite at Fabric Spark. Thanks. So many gorgeous ones. I like your grouping -- I am into golden colors right now. I really like the COTTON + STEEL HEXIES IN EGG. My favorite at Fabric Spark is IPANEMA MAIN BLUE! Adore the bundle. Very fresh and different which is my style! I love anything Tula and the Cotton and Steel line. I love the Floral Frolic in Coco! So cute! I like the Flower and Dot by Denise Schmidt. Thanks for the giveaway. I follow you on Bloglovin... would love win this bundle!! I love the Bank Swelling Blue. That is a great bundle that you have there. Classical Elements - Leaves Grey is my favorite available at Fabric Spark. I've recently fallen for grey and I've always loved nature prints. I think I may add this to my coming acquisitions list. I like Aqua City - love anything aqua. I follow you on bloglovin' Look forward to every post. Today I especially like Wonder in Pale Ink by Kate Spain. I really love your bundle but in particular Echino - Atori Yellow. Thank you for the chance to win that fab bundle! I like the CLETA - CYCLE OF LIFE as it looks funky enough for a quilt I have in mind for a niece. Frances Newcombe fabrics. Hoping the shop will soon have "Utopia"
I'm now following Fabric Spark and she can quilt by email. Love the COTTON + STEEL BASICS BUNDLE! I love this http://fabricspark.com/collections/art-gallery-fabrics/products/animalia-splendor or anything AGF. I love places that have custom bundles. I like that aqua city bundle and your featured bundle most of all. I really like the Janet Clare whales. I like Cleta. It reminds me of dandelions and watching them fly when you blow them. 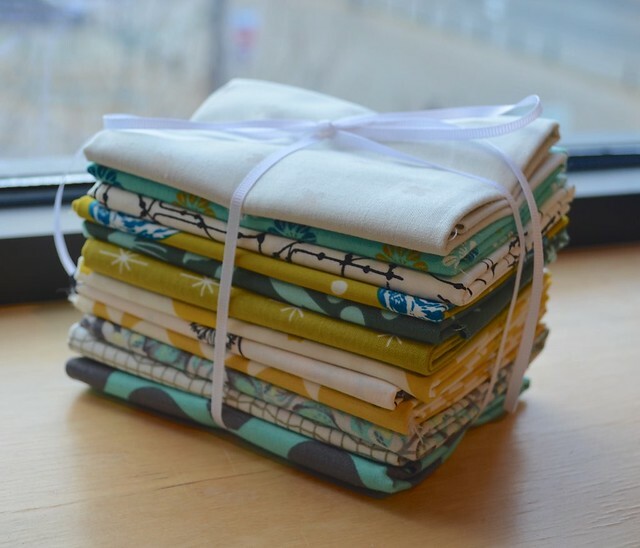 Beautiful fabric bundle. Oh wow Leanne!!! I am so glad you introduced me to this shop!!!! I can't pick one thing right now....I am going to get together with my sewing buddies and order soon. thank you!!! Love all of the Cotton and Steel mustangs! Hi and Thank You for the chance to win!! I am loving Cleta. I love the Classical Elements-Leaves and just might need to get me some. Always love a good leaf print.